You'll recall that W rays are selective. They melt some things, ignore others. As much as the aquarium may have wanted to be ignored--which was a remarkable feat for a supposedly inanimate object--it wasn't. The rays washed over it, discombobulating whatever molecular glue held it together. The aquarium turned bright pink, then ruptured, spilling plexiglass, piranha, Jehovah's Witness Protection Program agents, and hundreds of gallons of water all over the interior of the dirigible's gondola. The surging water knocked Miss Sebastos off her feet and the electro muscular disruption energy device out of her hand. She dived for it but Sheila's withering glance got there first. In a trice, it resembled an escapee from Dali's "Persistence of Memory." Realizing that those eyeballs were nothing to fool around with, Miss Sebastos wisely adopted the submissive "Wave Hands Like Clouds" posture. Sheila slipped her sunglasses back atop her nose, then she and Dr. Bleiber escorted the miffed Tai Chi instructor down the ramp from the dirigible to the rooftop. But Bob paused to collect a set of Tai Chia pets from the kitchen counter. (Why he did so would take a long and rambling extra chapter to explain. Suffice it to say his reasoning was sound.) Miss Sebastos liked the odds now, so she implemented Plan W. She knew from Dr. Bleiber's psychological profile that he had an abnormal fear of nematodes, so she abruptly dropped into the "Worm Crawls on Hot Pavement" position. Bleiber immediately cowered and backed into Sheila, knocking off her sunglasses. She quickly averted her eyes, but a stray W ray grazed the dirigible's tether, severing it. With a soft wheeze, the airship lifted gently into the sky. By the time Bob got to the doorway with the Tai Chia pets, it was too far to jump. "Mawk!" he understated, as the craft rapidly ascended, approximating the trajectory Icarus once took from Crete. As Dr. Bleiber gesticulated futilely to Bob, Miss Sebastos escaped into the Tai Chi building. Ignoring the doctor, Sheila got a fix on the dirigible, then blinked twice. Two pencil thin ribbons of W rays shot out from her eyes and poked two hubcap-size holes in the ship's dacron envelope. The hull began to deflate and the dirigible headed down, emitting dual raspberries a minor third apart. Meanwhile, a level-headed Bob had used skills that had lain dormant since he'd been a roustabout aboard Cousteau's Calypso to repair the aquarium. After refilling it, he gathered up the twelve fish a-flopping and eased them back into the water. He even administered cardiopulmonary resuscitation on one that had gone into oxygen-deprivation shock. In the process, he unwittingly "juggled the piranha" several times, but the toothy fish cut him some slack. This time. Whap! Miss Sebastos was back in her classroom, whacking a ruler against her palm as if nothing had happened. In front of her, eighteen giant starlings adopted the "Grasping Sparrow's Tail" posture. But instead of employing a gentle stroking motion, they used their beaks to fiercely tear into the imaginary birds' tail feathers. And yet they did so in a manner that conformed to Miss Sebastos' rhythm. Glancing out the window, she saw her dirigible spiraling slowly down into the adjacent rice paddy. When she spotted that damned macaque making off with her Tai Chia pets, she momentarily lost her (whap-ap!) rhythm. The starlings immediately became disoriented. And dangerous. They beat the air with their powerful wings, creating their own "Blowing Mountain Over" movement. Just at that moment, Dr. Bleiber entered the rear of the classroom. When he spotted the instructor, he yelled "stop!" That is, he meant to yell stop. But in all the excitement, he reverted to his native Finnish, saying instead "Aja hiljaa sillalla," or, "drive quietly on the bridge." This non sequitur drove the birds even deeper into disorientation. As Bleiber was trying to battle his way through the sea of flailing wings and failing, Miss Sebastos retreated into her office. She locked her door, then squeezed the head of the Annette Mouseketeer paperweight on her desk. A secret passageway opened in the wall, revealing the bottom of a ladder that led up to a hot beverage machine on the fifth floor Post Ophthalmological Care Unit in Saint Salmon's Hospital. Grasping the rungs--she never could get used to the way they faded in and out of focus--Miss Sebastos pulled the panel closed and started up. Sheila, meanwhile, had stopped to counsel members of the United Locksmiths Guild, who were attempting their first firewalk--that's when people walk over hot coals without burning their feet, thanks to self-empowering motivational activity coupled with fire-retardant heels. They complained that the embers wouldn't stay hot long enough for them to walk across them. Sheila examined the cinders and realized with a shock that the ninnies weren't using charcoal, but rather cordite! It was a miracle that it hadn't already blown them all sky-high! No less a miracle was that her gaze failed to detonate the highly explosive powder. She shared with the walkers the bag of charcoal briquettes that she was fortuitously carrying, then ran into the rice paddy to head off the fleeing macaque. She had just passed the grounded dirigible when a huge explosion turned the locksmiths--who weren't so lucky after all--into locksmithereens. The blast distracted Bob long enough for Sheila to overtake him, and it took no more than a sidelong glance to convince him to return with her to find Bleiber. And now, Miss Sebastos was in a quandary. She had reached the top of the ladder and pushed open the front of the hot beverage machine, only to find giant starlings "Guarding the Hallway." If this was a Tai Chi movement, it was the first one she'd ever seen that involved semiautomatic weapons, for each of the birds was armed--or winged, really--with an Automat Kalashnikov, one of which was pointed at her. She pushed past the "extra cream" nozzle and clambered slowly out of the machine effecting the "Wave Hands Like Clouds" posture. She stood silently, assessing the situation. There were ten birds in all. Four were in a corner of the corridor pecking at what smelled like a nematode pizza. Four more tended to a nest in which lay a dozen glossy eggplants. One hopped nervously back and forth, occasionally glancing out the window. They were harmless. The one that still had its rifle trained on her, however, wasn't, for it had an itchy trigger beak. But then Fate, last heard from during Ruby Primavera's impromptu career change, intervened. A dozen locksmithereens suddenly smashed into the fifth floor windows of Saint Salmon's Hospital. Simultaneously, Miss Sebastos altered her movement ever so slightly, turning the generic clouds into cumulonimbuses. A downpour ensued, during which most of the bewildered birds took flight. Miss Sebastos then combined "Grasping Sparrow's Tail" with "Pushing the Mountain" and knocked her stunned guardbird onto the pizza. She fled down the corridor, but just as she reached the stairway, a large figure stood up and blocked her path. Those long, thin fibers that trailed from his jacket and trousers--it could only be Asbestosman! But ... but he'd been de-fiberized by that floozy from the JWPP! Had he somehow been renovated? And why did he all of a sudden seem not glad to see her? As long as we're posing questions: (1) Whatever happened to Ruby Primavera, last seen in a fish costume in an aquarium aboard Miss Sebastos's dirigible? (2) What possible significance do the Tai Chia pets have? And (3) Will we ever learn how to "juggle the piranha?" If you think you know the answer, write to us. 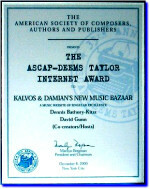 The address is Kalvos & Damian's New Music Bazaar, Episode No. 511, Nonpop International Network, to the attention of Kalvos.